Day 16: A Sewaholic Renfrew shirt and a new pair of Ginger Jeans (now all finished, to be blogged). Day 17: A Bonn shirt and denim Tillery Skirt. Day 18: A Josephine top and Chi-Town Chinos. I love this outfit but it needs work. I need to loosen the elastic in the sleeve hems of the top, and just make a new pair of the chinos, since these are too tight in the thighs and bag out to the point of falling down within a couple hours' wear. Day 19: A Plantain tee with a brand-new cropped Blackwood Cardigan and my first pair of Ginger Jeans. Day 20: My short-sleeved Portfolio dress and first Blackwood cardigan. Day 21: A Josephine tank, McCalls 6996 and my linen McCalls 7364 pants. Day 22: A Sewaholic Renfrew and a self-drafted doubleknit pencil skirt. Day 23: Pony Tank and McCalls 7364 again. Day 24: Seersucker Bonn shirt and my first Ginger jeans. Day 25: Pony Tank and McCalls 7364 again. Day 27: A Blank Slate Catalina dress (unblogged) and my cropped Lisbon Cardigan. Day 28: A black rayon Kirsten Kimono tee, my first Blackwood Cardigan and my second pair of Ginger jeans. Day 29: Orange Kirsten Kimono tee and my denim Tillery Skirt again. Day 30: Josephine top, my newest Blackwood Cardigan (to be blogged) and my newest black twill Ginger Jeans (they weren't complete yet; I wore them all day before topstitching - blog post soon). Day 31: Sewaholic Renfrew and those black Gingers, now completed. 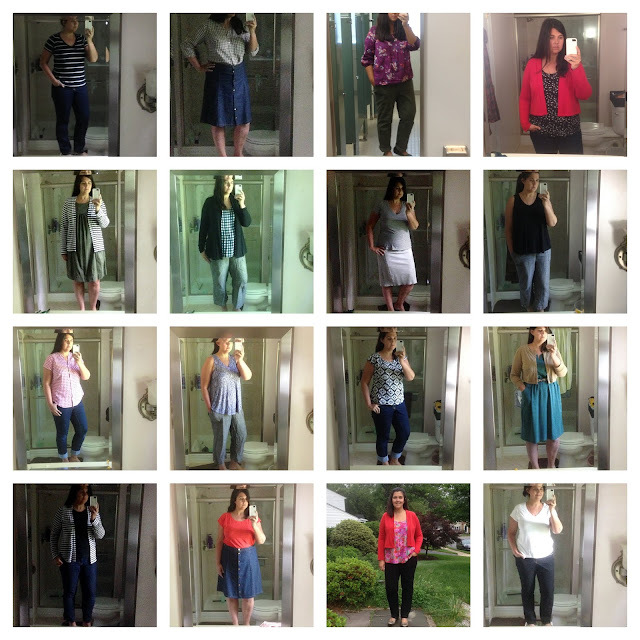 I wore 49 different items with one accidental outfit repeat. My most-worn items were my linen pants (four wears; I had to stop myself from reaching for them multiple times). I wore jeans 10 times, but that was split over four different pairs. I would have worn my Chi-town Chinos more, but they really don't fit well and I plan to replace them later this year. I also would have worn my Calyer pants more if I had more tops that go with them. I was definitely more into pants than skirts this May, even though it was warmer than it has been previous years. The last week or so, I got tired of coming up with new combinations. I'm glad I forced myself to stick to my pledge, as I came up with a couple new outfits that I really like. So that's a wrap on MMM '18. It was a success, but I'm glad it's over, so I can go back to wearing the same things over and over again! This is so great! I only made it 2 weeks, but you did the whole month! Seems like you gained some quality insights.